It’s been a very busy year for the PRI. Following our 10-year anniversary events last summer, we set ourselves the task of putting together our Blueprint for responsible investment, our vision for the next decade. This was done in consultation with our signatory base worldwide. Your feedback was invaluable for turning the Blueprint into a reality. As we began putting the Blueprint together, some of you raised concerns that it meant stepping away from our core work. Nothing could be further from the truth. The number one priority for us as an organisation remains responsible investment happening across all investment classes and everything we do underpins this goal. The nine priority areas outlined in the Blueprint evolve out of our existing work on issues such as climate change, empowering asset owners with the tools they need for better ESG integration and creating more active owners. The PRI now has over 1,700 members and our signatory base remains extremely diverse, from very small organisations to some of the largest pension funds and fund managers in the world. This diversity means that not everything we do will be relevant for everyone. But we will only undertake work when we have established through interaction with our signatories that it will bring tangible benefits to a significant number of them. And we will be careful only to undertake work where we as an organisation are best placed to deliver signatory value. The criteria we will use to make this assessment are outlined in the Blueprint. As some of you may recall, at PRI in Person last year in Singapore, we pledged to make signatories more accountable. We also addressed the issue of how to build a more sustainable financial system (SFS), which is central to our Mission. Both accountability and our SFS work feature prominently in the Blueprint. Our priority now will be the implementation of the Blueprint over the next decade. The nine priorities we have identified are long-term projects and we look forward to working with our signatories on these activities over the coming years. Aside from our work on the Blueprint, the PRI celebrated a number of other accomplishments last year. We saw strong asset owner growth, welcoming a number of new signatories. To meet our ever-growing signatory base, the PRI is continuing to expand its presence across the globe, strengthening our team in the US and our teams in Europe. In Asia, we have been forging ties with organisations such as the Asset Management Association of China and the People’s Bank of China, both of whom are helping to enhance ESG activities in the region. In order to better promote responsible investing in this market, we are looking to recruit a Head of China role, a particularly exciting development. One of the biggest issues facing many countries in Asia is, of course, air pollution and environmental degradation caused by climate change. We are continuing to focus on climate-related activities, which our signatory base indicated to us is their number one concern in terms of being a material risk for investors. We will work with organisations such as Ceres, the Asian Investor’s Group on Climate Change, IIGCC and others on climate-related initiatives. Finally, I am very proud to say that I have been re-nominated for another three-year term as chair of the PRI board. It has been my pleasure – and my privilege – to work with you and I look forward to our continued association. Thank you for your support in all that the PRI is trying to achieve. There’s nothing quite like the end of a decade to reflect on what has been achieved and then look over the horizon to think about what happens next. That was very much at the heart of the PRI’s work last year. As we celebrated our tenth anniversary, our thoughts were very much not just on the progress that we had made in the past decade, but on developing our next steps and priorities. We wanted to develop a blueprint for responsible investment that would outline and clarify the PRI’s priorities for the next 10 years. To do this, we held over 20 roundtables with signatories around the world – from Sydney to Madrid, to Cape Town and São Paulo – and asked them to help us identify the critical, systemic risks and sustainability challenges responsible investment will face over the next 10 years. We also celebrated our ten-year anniversary with events in London and New York where we discussed what the future should hold for the PRI. Over 1,000 signatories participated in these events, making it our most extensive signatory consultation exercise to date. This insight helped us to form our Blueprint for responsible investment, our mandate for the next decade. It sets out how we will address the world’s sustainability challenges through nine priority areas. One of these includes the creation of a more sustainable financial system, which is integral to the PRI’s Mission. We know that the financial sector still suffers from short-term thinking and a lack of incentives around sustainable investing. To address these issues, we have launched our Sustainable Financial System programme. This project will help us, and our signatories, to develop a framework that will contribute to a sustainable financial system that focuses on the long term for all investors, not just a favoured few. The programme will address key risks, such as short-termism and misaligned incentives to move financial markets to thinking with a long-term mindset. We will also be tackling the threats of climate change and connecting our work to the UN’s Sustainable Development Goals (SDGs). Our work on the SDGs in particular will strengthen the link between responsible investment and the real world – to support this, we have developed an SDG advisory committee and are building the SDG investment case. By publicly setting out these measures, we’re laying out exactly what we want to achieve – and crucially, holding ourselves to account. This is particularly relevant given the fact that we announced last year that we would begin the process of delisting signatories who do not demonstrate a minimum standard of responsible investment activity. 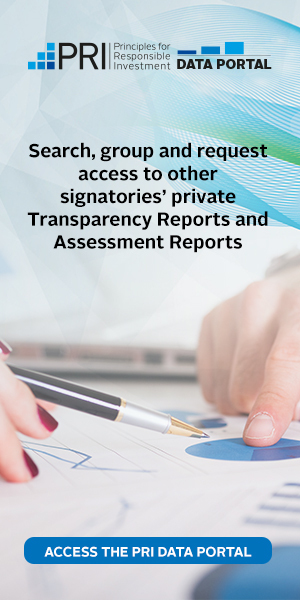 We believe that this will help to hold every signatory accountable and ensure the PRI’s relevance for years to come. One of the highlights of developing the Blueprint was the extensive involvement from our signatories. I saw first-hand time, time and time again, a real dedication to moving the responsible investment agenda forward. I am extremely grateful to every one of our signatories who contributed to the Blueprint, whether in person or online. We’re in the fortunate position whereby we can call on our dedicated and engaged signatory base for their expertise. It’s only through collaboration that we truly move forward with one united voice, addressing the challenges of the current financial system and developing best practice. Through doing this, and making their voices heard, every one of our signatories has played their part in helping us achieve our Mission. Signatories have been making their voices heard in other ways too. They have been especially vocal during proxy season, particularly on resolutions around climate. In fact, there has been a 77% increase in posts on our Collaboration Platform compared with the previous year. Of those posts, 37% were related to climate. This increase in active ownership shows the important role investors play in responsibly guiding their investee companies. On the signatory front, it was a very successful year in terms of recruitment. We were delighted to welcome back four Danish signatories who left us in 2013. Further afield, we made new inroads into Asia as we welcomed our first Chinese asset manager signatory, China AMC. In fact, our overall net signatory base has grown by 14%, with 289 new signatories, adding US$6.4 trillion in AUM. Of those 289 signatories, 43 were asset owners. To support this ever-expanding signatory base, we have bolstered our staff numbers. We now have our first-ever full-time members of staff in France, Canada and Australia, and have grown our team in the United States. Another highlight of the year includes the fact that our PRI Academy has seen a 43% growth in uptake of its courses. I want to extend my sincerest thanks to both signatories and staff for their input and enthusiasm over the past year – and indeed, the past decade. In particular, I’d like to thank those who give up their time to participate in working groups and advisory committees. I would also like to give special thanks to Martin Skancke, PRI Chair, all the members of the PRI Board and the board committees for their leadership and guidance. What we have accomplished together this year is encouraging but now is not the time to rest on our laurels. Although the PRI has been fundamental to creating a global responsible investment community, there’s a long way to go until we see true ESG integration across the world. So, here’s to another ten years of responsible investment. Let’s keep moving forward together.